Thomas ‘Tommy T’ Gobena is a bassist and producer living in Washington D.C. He currently plays bass in the multicultural gypsy punk band Gogol Bordello. Born and raised in Addis Ababa, Ethiopia, Thomas moved to the USA in 1987 to attend college. 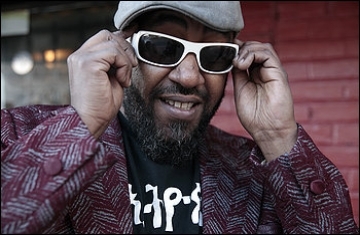 While studying, he began playing bass in the DC metro area – firstly with Ethiopian bands, and then forming reggae band ADOLA. ADOLA backed many well known Ethiopian artists, including Aster Aweke and Gigi. Thomas also worked with Wayna Wondwossen, nominated for a best urban performance Grammy for her song Lovin’ U (Music), and produced tracks on her Moments of Clarity album with friend Abegasu Shiota. While collaborating on a project with guitarist Eran Tabib in 2006, he heard Gogol Bordello (described by All Music Guide as “one of the most explorative and inexhaustibly creative bands on the planet”) was looking for a bass player familiar with international grooves. Thomas’ knowledge of global rhythms has since become a key part of the band’s ever more expansive sound. He has since recorded three studio albums with the band (Super Taranta, 2007; Trans-Continental Hustle, 2010; Pura Vida Conspiracy, 2013), plus the limited Russian release Моя Цыганиада (2011) and DVD Live From Axis Mundi (2009). With the encouragement of his Gogol Bordello band mates, Thomas produced his first solo album, The Prester John Sessions, in 2009. An aural travelogue that rages freely through the music and culture of Ethiopia, Prester John was well received by critics: “Another reminder that the country once believed to be the source of the Prester John legend is also one of the musical powerhouses of Africa” (The Guardian); “A love letter to the African state that is always affecting and occasionally magical” (The Skinny). In 2013, Gogol Bordello released its sixth studio album, Pura Vida Conspiracy, which Q Magazine called “rougher, tougher and altogether more like the raucous joy of their live shows”. The album’s release is backed up by a global tour schedule which continues throughout 2014. Find out when Gogol Bordello are next hitting your town by visiting their tour schedule.